Clear and convincing evidence of honor system violations in this class will result in the submission of formal written charges to the Office of Judicial Affairs & Academic Integrity. Under these circumstances the instructor does not give warnings or ask students for explanations. The Americans with Disabilities Act of 1990 requires VCU to provide an "academic adjustment" and/or a "reasonable accommodation" to any individual who advises us of a physical or mental disability. If you have a disability that requires an academic adjustment or accommodation, please arrange a meeting with the instructor as soon as possible. Additionally, if your course work requires you to work in a lab environment, you should advise the instructor or department chairperson of any concerns you may have regarding safety issues related to your limitation(s). Please contact the appropriate Coordinator of Service for Students with Disabilities to obtain an official memo detailing the academic adjustments or accommodations which you need. Students should familiarize themselves with the guidelines for appropriate student conduct as outlined in the VCU 2006-2007 Resource Guide. During class it is expected that inappropriate electronic devices (cell phones, pagers, etc.) are turned off. 1. Sign up to receive VCU text messaging alerts (http://www.vcu.edu/alert/notify). Keep your information up-to-date. 2. Know the safe evacuation route from each of your classrooms. Emergency evacuation routes are posted in on-campus classrooms. 3. Listen for and follow instructions from VCU or other designated authorities. 4. 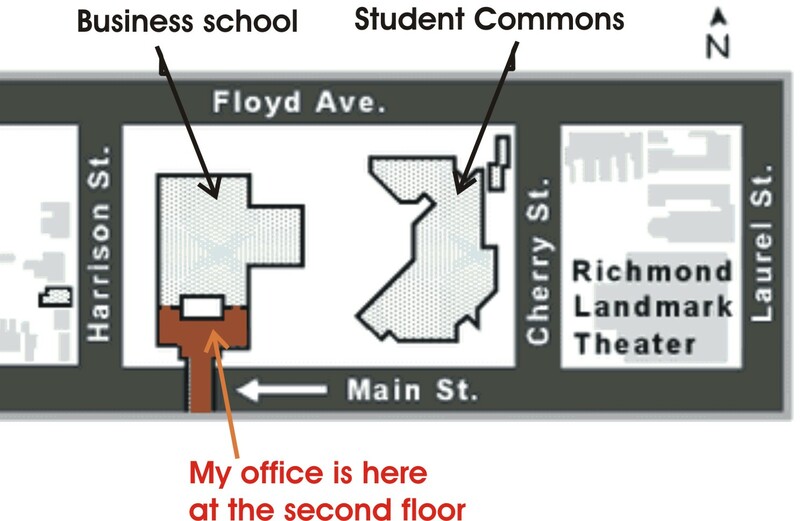 Know where to go for additional emergency information (http://www.vcu.edu/alert). 5. Know the emergency phone number for the VCU Police (828-1234). Report suspicious activities and objects. It is your responsibility to be familiar with all the details regarding the handling of the course. Make sure you examine them carefully before your first day of classes. You are responsible for all announcements made on the web, during lecture, and during studio. These announcements will include any schedule changes and assignments. The webpage of the course is an integral part of the course. It is your responsibility to access it regularly in order to get all the relevant information as the semester progresses. Office: Oliver Hall - Physics, room 2008. Due to the very high volume of spam e-mail, only the e-mail with the above subject line will be checked and replied to. I check my e-mail Monday through Friday between 9:00 am and 5:00 pm. The course consists of lecture and studio. They are to be taken together the same semester. The studio will be held in Temple 3316. The studio manual: Wonders of Technology, Peter Martin. Note: During the classes (lecture and studio) all cell phones should be turned off. Buy a CPS keypad from the VCU Bookstore. Bring your keypad to every lecture!